"TRIPLE BARRIER PROTECTION" - "We kill what bugs you!" 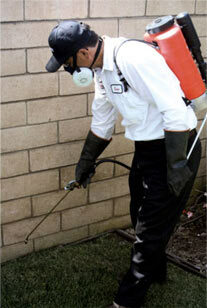 Let Hired Killers Pest Control provide you with a pest control solution that is tried and true. We have tested methods and proven products that will ensure you a comfortable living environment even in the most bug infested situations. Our "Triple Barrier Protection" method was designed to be the most effective and friendliest treatment protocol for your home or business. Hired Killers technicians are trained to help you pinpoint areas that may need minor repairs to help prevent insect entry or harborage. Overall we strive to provide a safe and pest free environment! This is where the majority of the service is performed. It starts with a 5 foot wide barrier of a sand based granule that is broadcasted around the structure. The granules settle at the soil level and activated by water. (Rain or Sprinklers) This is your first line of defense. The second line of defense on the exterior consists of spray application that is applied to the foundation up to 3 feet high, accessible overhang perimeter, around window/door frames as well as various other cracks and crevices on the exterior of the structure. Hired Killers Pest Control is one of a few companies that use a backpack sprayer to make applications instead of a large power sprayer. This is important in that control of pest can be obtained by using much smaller volumes pesticide in our environment, which is best for all!! The third phase in our "Triple Barrier Protection" method takes place indoors and sets in place your final line of defense. It consists of an application to the baseboard perimeter of the home, pipe fittings under sinks, window tracks, and under appliances. Various other areas in your home may be treated depending on conducive conditions found and your individual needs. Bait and insect traps are also utilized on the interior in sensitive areas of the home or for specific infestations.